UNITED NATIONS, December 17 -- Days after a fight in the Somali Mission to the UN in New York, reported exclusively by Inner City Press, the new Somali Minister of Information, Post and Telecommunications Abdulkareem Jama came to the UN to describe the new government he is a part of. He said that many of the 18 new ministers are from the Somali diaspora. Of former Deputy Permanent Representative Idd Beddel Mohamed, who showed up at the Somali Mission saying that the new foreign minister gave him authorization to return, only to have the police called to throw him out, Abdulkareem Jama said that wasn't yet decided. The chaos of Mogadishu, then, is echoed in Manhattan. Abdulkareem Jama put a relentlessly upbeat spin on Somalia, saying that Mogadishu is 55% controlled by the Transitional Federal Government. Inner City Press asked about reports of the TFG and Puntland using private military contractors or mercenaries. Abdulkareem Jama said that the contractor's work involves training for “VIP protection” and for a coast guard. He did not address whether the arrangement, which is shielded in secrecy, may violate the UN's Somalia sanctions regime. Inner City Press asked about the memorandum of understanding between the World Food Program and the Organization of the Islamic Conference to deliver food in areas controlled by Al Shabab, which has barred WFP. 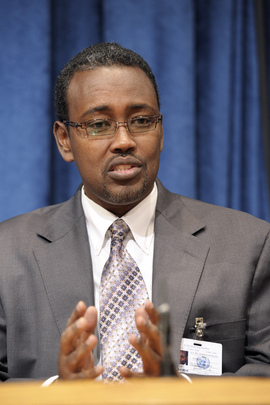 Abdulkareem Jama spoke favorably of the deal. But WFP still refuses to provide a copy of the MOU -- Inner City Press has asked -- and even the UN Office for the Coordination of Humanitarian Affairs says it has not seen the MOU. Following the Obama administration naming the TFG as a user of child soldiers, Inner City Press asked Abdulkareem Jama for the update. He said that child soldiers have been identified and are being kept in a camp until they reach the age they can decide what they want to do. Video here. Of once and perhaps future UN official Charles Petrie, whom the UN claimed would be working for the UN in Mogadishu, Abdulkareem Jama said Petrie will be working for the EU or someone else, not the UN. Of the TFG's deputy minister for water barring work by UNICEF and others and then rescinding the order, Abdulkareem Jama said that the deputy minister had been frustrated but had taken the order back. Again, the chaos of Mogadishu, reflected in Manhattan. We wait to hear from Idd Beddel Mohamed. Watch this site. Footnote: Somalia's Permanent Representative said that on December 22, the Security Council “will” pass a resolution authorizing 4000 more troops for AMISOM. While technically the resolution is not yet agreed to (or “in blue”) Council sources tell Inner City Press that is the number: 4000. We'll be here. 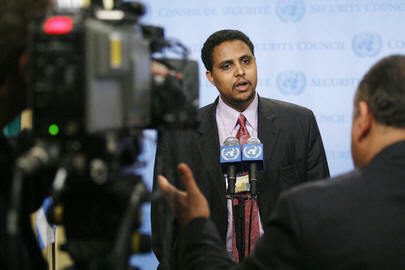 UNITED NATIONS, December 15 -- As the UN World Food Program continues to withhold its Somalia Memorandum of Understanding with the Organization of the Islamic Conference, even from other UN officials, a once and perhaps future Somali diplomat has reportedly reappeared at the country's Mission to the UN and had the police called on him. Idd Beddel Mohamed, who Inner City Press interviewed in 2007 as Deputy Permanent Representative denounced UN payments to warlords, recently came back to the Somali Mission, according to sources, saying that the new Foreign Minister Mohamed Abdullahi Oomar had authorized him to enter. But the current Permanent Representative said he'd heard no such thing, the sources say, the police were called to oust Idd Beddel Mohamed. Meanwhile, after both Mark Bowden, UN Resident and Humanitarian Coordinator for Somalia and Ms. Kiki Gbeho, Head of the Somalia Office for the Coordination of Humanitarian Affairs told Inner City Press they had not even seen WFP's agreement with the OIC, on December 14 Inner City Press asked OCHA chief Valerie Amos about it. Ms. Amos answered that OCHA can't compel any UN system agency to “coordinate” with it. Video here. On December 15, Inner City Press asked UN spokesman Martin Nesirky if Secretary General Ban Ki-moon thought that UN system agencies should reach and withhold secret deals. Nesirky said he had nothing to add to what Mr. Bowden and Ms. Gbeho had said. A WFP spokesperson has emailed offering to talk about the MOU and has been asked to provide a copy. He replied "I can't email the MOU to you." Watch this site. Footnote: at the December 15 noon briefing, Inner City Press asked UN Spokesman Nesirky about reports that the Somali Transitional Federal Government has ordered UNICEF and other UN agencies to stop their work in Somalia, for missing a meeting about the drought. Previously, Inner City Press asked UNICEF's spokesman, but he is out of the office for a long time (question have been backing up for the past two weeks). Nesirky said that events have moved on and that the Somali block is not (any longer?) in place. We'll see.